Built in 1801 for Hassanamisco Nipmuc Lucy Gimby, the Cisco Homestead serves as the largest artifact in the Museum’s material culture collection. It also housed the rest of the Museum’s collection from 1962 until the building closed for repairs in 2006. Stabilization of the structure will begin after this year’s Indian Fair on the Hassanamesit Reservation (Rez) (Sunday, July 25th!!!). Plans for restoration include returning the original 1801 room to that time period as well as the other historic parts of the Homestead. This means that different rooms will be restored to different time periods. Visitors to the museum will be able to follow the evolution of the Homestead from 1801 to the 1960s. The Cisco Homestead on Hassanamesit. The Rez itself represents the only land in Massachusetts that has been continually occupied exclusively by Native people. The 3.5 acre site is what remains of the division of Hassanamesit (later the town of Grafton) into lots for the Nipmucs that already lived there and the English settlers that desired the land in 1728. 1. Moses Printer b. bef. 1665 in Hassanamesit, d. abt. 1727 in Hassanamesit m. abt. 1719 to Mary b. abt 1675 in Natick, d. Feb. 1759 in Grafton, Massachusetts Bay Colony. 2. Sarah Printer b. abt. 1718 in Hassanamesit, d. 1771 in Grafton, MA m. abt. 1733 to Peter Lawrence b. abt. 1693 in Hassanamesit, d. bef. 1771 in Grafton. 3. Patience Lawrence b. abt. 1745 in Grafton, MA Bay, d. 1794 in Grafton, MA m. abt. 1766 to Ceasar Gimby b. abt. 1730, d. 1795 in Grafton MA. 4. Lucy Gimby b. abt. 1769 in Grafton, MA Bay, d. 18 Mar 1843 in, Grafton, MA (1) m. abt. 1787 to Harry Arnold b. abt. 1765 in Smithfield, RI, d. bef. 1790 in RI (2) m. 22 Sep 1791 in Grafton, MA to Monday Hector b. in Holland , MA, d. abt. 1824 in S. Brimfield, MA. The above genealogical information is from the Nipmuc Nation Research Office. Lucy had one son from each of her husbands. Her younger son, John Hector married Susannah Toney and eventually sold his share of the reservation and moved to nearby Worcester, MA. His descendants today include some of the the Carruthers, Walkers, and Browns. 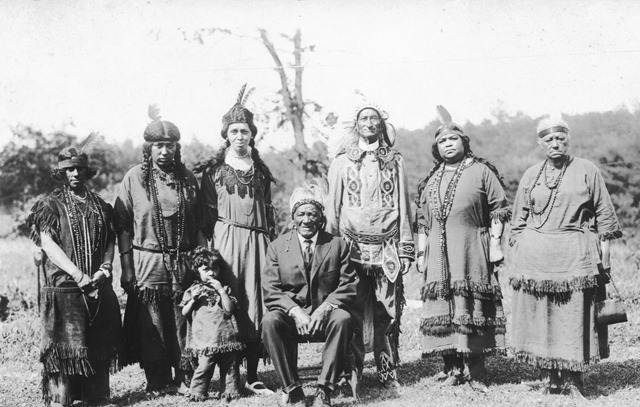 Lucy’s eldest son, Harry Arnold, and his descendants, the Ciscos, remained on the reservation and living in a part of the Homestead until 2006. Ciscos and others c. 1930.